What is it about BonChon Chicken that has people lining up for a bite? 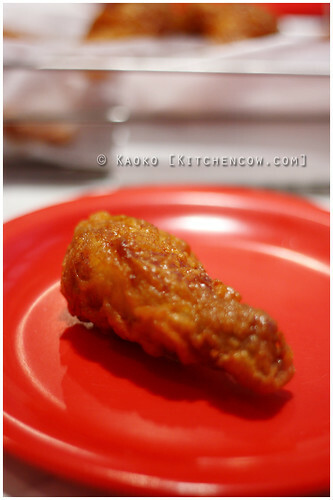 When the Korean Fried Chicken Wing chain first opened in Manila, the queue was epic. But more so were the satisfied sighs you’d hear when talking to someone who has tried their chicken. It’s probably calorific, but we were way past caring. It took me months before I got my first bite at their then newly-opened branch at Ayala Triangle Gardens. Caught in a sudden downpour, my friend– let us call her Mrs. J. McAvoy– and I decided to grab a snack to wait the rain out. We ordered a dozen wings. Six for each of us and some fries. We excitedly awaited the arrival of our chicken. It was the first time for both of us to try BonChon and everything we heard from friends was positive. Gingerly, I used a fork and knife to pry a bite of spicy chicken wing. It was difficult because of the crisp coating that refused to just give in. I took a bite and was silenced. It was magical, that moment when your teeth crunch into the crisp, thin skin. Double-fried, the chicken remained crisp, light and flavorful. Instead of thick breading, what you got was chicken straight up. The chili flavor was wonderful, adding a spicy hit to the juicy-crunchy-astounding chicken wing. After that bite, both of us threw our knives and forks aside and dove into the basket, grasping the evil little marvels while licking our fingers in between. We ordered a mix of both flavors. The Spicy Chili and the Soy-Garlic. Slightly sweet and devoid of heat, combining both was genius. Mrs. McAvoy and I alternated between Chili and Soy-Garlic, treating the heat with a sweetened bite, then moving back to Spicy once the heat from the first wing dissipated. Heaven. It was crispy chicken heaven. After that, we couldn’t talk about anything else but the deliciousness we gorged ourselves on. Do not bother with silverware. 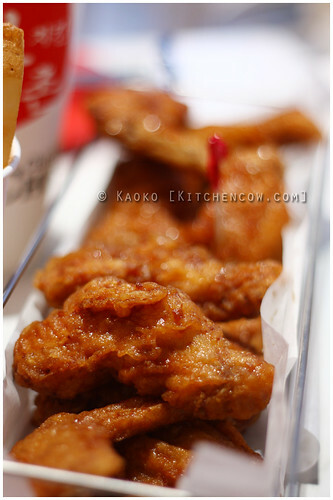 BonChon Chicken is finger food. Licking your fork is not as satisfying as licking your fingers. The rain continued to pour, an unrelenting attack on what was supposed to be a bright, summer day. But we had no care in the world. Who cares if we didn’t have umbrellas? We had our BonChon chicken. It was more than enough happiness to keep us nice and cozy on an otherwise dreary, rainy day. @Kate BonChon loves us too! My favorite in Bonchon is that chicken crisps thingy…I’m not sure what it is. It sort of looks like a fillet but not quite. Gah, I forgot. and i love your doll! I’m not sure if they’re chicken chops or what. Basta, yung chicken fillet! Chicken ng tamad maghimay, hahahaha! Theo’s a Japanese doll called Dal. He was originally a girl called Dal Dotori but I rewigged and rebodied him into a boy. I bought him at a small store in Mongkok, HK, but you can find dolls like him online. Just search for Dal, Pullip or Taeyang. You can see more of them in my Flickr. Just click on any of the photos here to be taken to my Flickr account. wow this looks delicious! 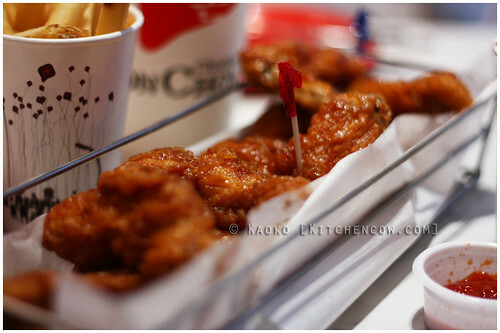 i saw a bon chon chicken restaurant open where i pass by to go home from the gym…big temptation!!!! Megamall has opened, according to Kyam! Go get!